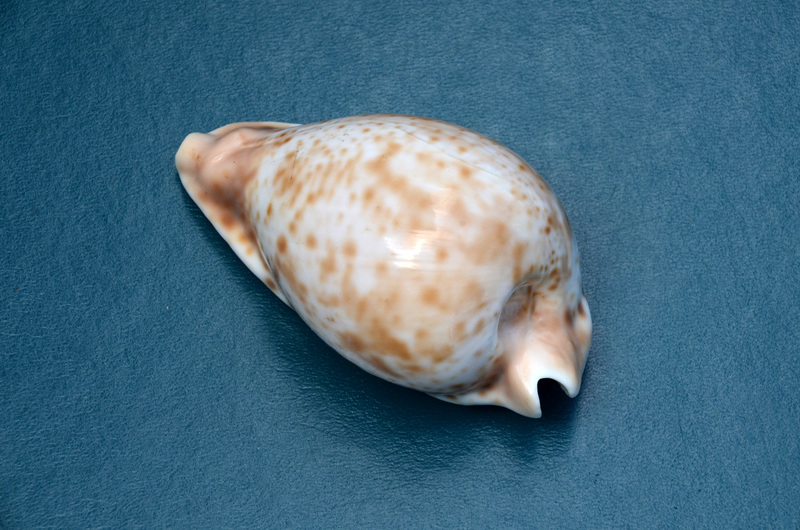 Our shell of the month was originally described as Cypraea umbilicata Sowerby, G.B.I., 1825, the Umbilicate Cowry. Unfortunately Sowerby hadn’t done his homework and the name was ruled invalid. Finally in 1919, close to a century later, naturalist Tom Iredale named it hesitata, the Undecided Cowry because it was so late in getting a proper name. Umbilia hesitiata is called the Wonder Cowry. It’s a large shell of 70-100mm with rostrate terminals and a sharp bend to the posterior. The surface is unlike that of any other Cypraea due to minute granulations that give the shell a waxy appearance. The vast majority of hesitata look very similar to this one, white with a light brown mottled pattern. Darker specimens are scarce and very dark colored ones bring a substantial premium that could more than double the price. 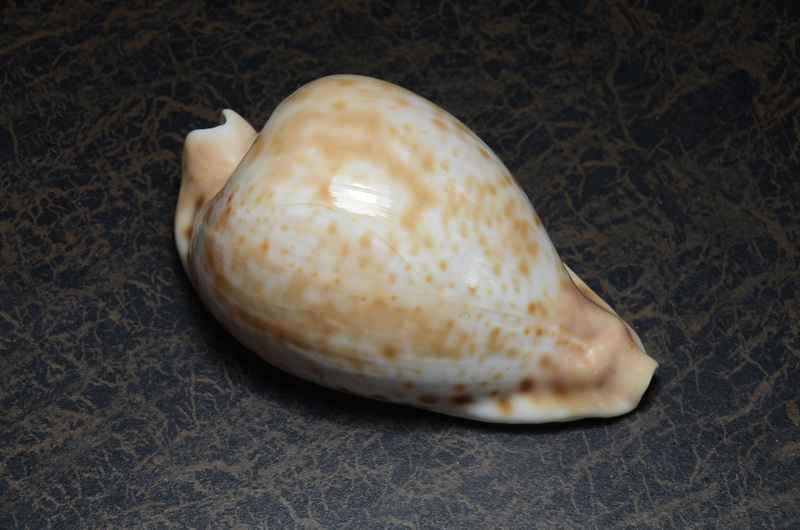 This shell was very rare until fishing fleets trawling the depths off New South Wales and the southern Australian coast began netting specimens. It is interesting that the prices on close relative Umbilia armeniaca have dropped dramatically due to increased fishing whereas it’s prices have crept upwards to the point where the two are now close in value. Several years back one could purchase nice specimens of hesitata for about $20-$25, not anymore. Today there is an extreme range in price running from about $30 on the low end to over $100 for exceptional specimens. One reason for the variation in price is that few specimens grade gem as hesitata often suffers flaws. On this specimen the terminals are intact and there are no sand inclusions nor dull areas, however it does have a well healed growth line on the dorsum making it grade as F++.